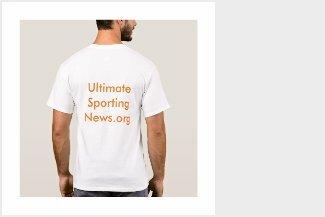 Ultimate Sporting News: Speed star! Team USA's Jocelyn Lamoureux-Davidson scored twice in six seconds to set a new Olympic record for speedy scoring as her team beat OAR 5-0 in Korea. "They told me it was a record back there, but I had no idea," she said. "I guess whenever you're able to score two quick goals like that, whether it's one player or back-to-back shifts from a different line, it just adds to the momentum. Scoring two quick ones like that is pretty cool, I don't think I've ever done it before." Lamoureux-Davidson's first was a family affair to make it 2-0, with Russian goalie Valeria Tarakanova left cursing her luck after a solid block on Monique Lamoureux-Morando’s shot dropped kindly for Lamoureux-Davidson to capitalise on hesitant defence and put the puck away. "There was a rebound on the first shot and it came through at the back door and I barely got that one in, then from the face-off I think their D just kind of miscommunicated and I was able to poke it through and walk in with quite a bit of space," the goalscorer added. Much of that early resilience was down to netminder Tarakanova and a hard-working defence. 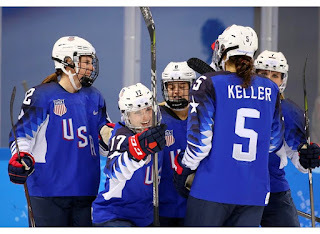 The goalie set the tone early with a fine pad save to deny Hilary Knight after Megan Keller’s deflected shot offered the forward a wideopen net to aim for. "I knew I'd face a lot of shots from the Americans, it's never easy to play against them," said Tarakanova. "I stopped everything I could." Morozova produced a great save early in the third frame to deny Lamoureux-Davidson a hat-trick, and was saved by a video review in the 51st minute. Hannah Brandt thought she had scored when she swatted home the rebound from her own shot, but the video showed the American forward steered the puck into the net with her hand. Brandt eventually got her name on the scoresheet in the 59th minute, wrapping up after Cameranesi's rush into enemy territory. Next up, the Americans face Canada in a battle for top spot in Group A - and potentially a psychological edge at the sharp end of the tournament. Like any encounter between the neighbours, there's plenty riding on it. "We want to win that one," said Lamoureux-Morando. "We want to be the number one seed here. We want to see where we are against them right now. Those are the games you really get up for, it's a great rivalry and a great test." "We are creating some half-decent chances," captain Olga Sosina insisted. "But somehow our finishing isn't quite there. All of the forwards need to think about how we've played in the two games up to now, so we can do better against the Finns and turn the minuses into pluses.